A comprehensive guide for horse owners who want to learn more about proper shoeing and hoof care for their horses. It also serves as a detailed manual for those considering horseshoeing as a career. 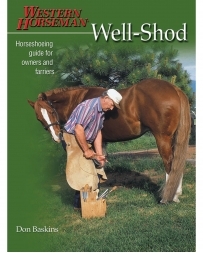 Easy-to-read detail and hundreds of photos and illustrations show step-by-step trimming and shoeing methods. By Don Baskins, 160 pages.